Orange telia swell when wet. This is also called broom rust due to these witches' brooms. The central ball of shoots is a tight mass of short stems called a witches' broom. Shoots are generally much more open in habit. Telia swollen from recent rains. The orange blobs of the fungus (telia) have dried-up on the scales. Cause Gymnosporangium libocedri, a fungus found frequently on incense-cedar (Calocedrus decurrens). Alternate hosts are apple, crabapple, hawthorn, mountain ash, pear, quince and serviceberry (Amelanchier). 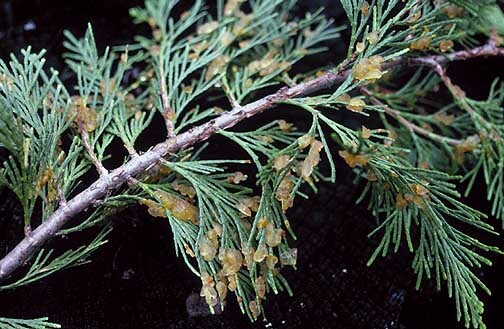 Infections on incense-cedars in early spring produce spores in jelly-like orange masses (telia) during wet weather. Telia may produce spores over several weeks in the spring. The spores do not re-infect incense-cedars, but are windblown to the deciduous host. Spores can be blown in the air for up to 6 to 10 miles. On the deciduous host, leaf spots will be produced later in the spring. Spores produced on this host are windblown to the incense-cedars, where they initiate infections. The jelly-like orange masses will be seen the following spring. 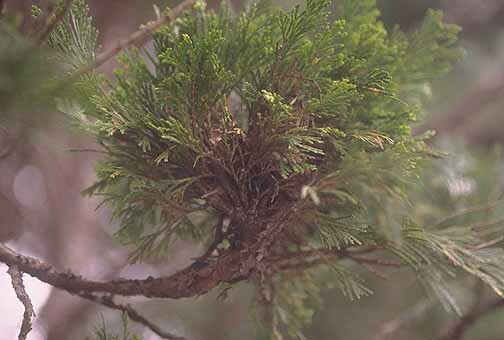 Spores, from a single infection, may be produced over a 2- to 3-year period on cedars. 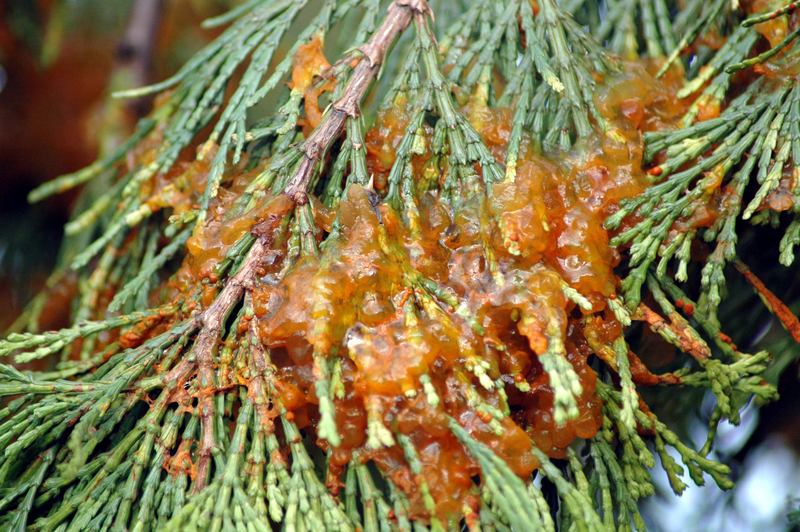 This is not cedar apple rust, although the diseases are related. 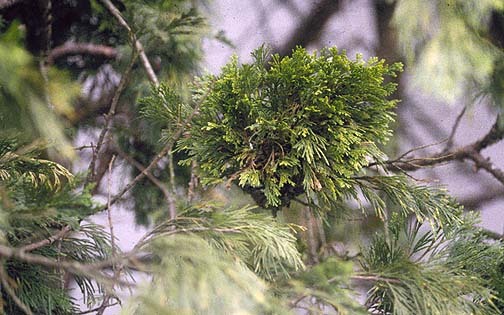 Symptoms Infected branches can produce a witches' broom-a perennial structure in which the branch at the base of the broom is swollen with the growth of many short lateral shoots. Telia are cushion-like, reddish-brown, and not very noticeable until spring. During spring rains, telia form orange, jelly-like deposits on leaves and branches. Trees may appear to glow orange during the main flush of telia. These dry to a light-orange film but can become swollen again with subsequent rains. Trees with many infections decline and may eventually die. Witches' brooms may not be present on landscape trees. Mature incense-cedar trees can often sustain many infections without significant adverse effect if they are otherwise healthy. Incense-cedars that are under chronic stress and those that are very young or recently planted may be adversely affected by heavy infections. Remove and destroy cedar brooms before spring. Remove alternate hosts from around the planting. Avoid overhead irrigation that wets foliage for extended periods of time. 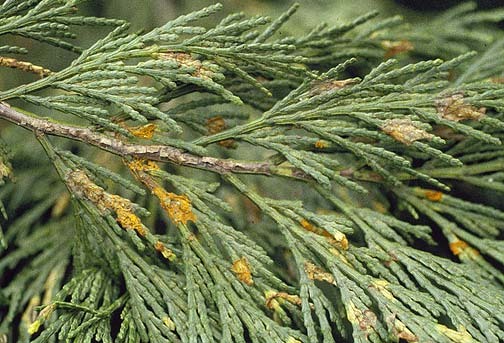 Chemical control Applications to cedar in western Oregon and Washington should start in late spring through early summer when spores are available for dispersal from rosaceous hosts. Bayleton 50 T&O at 5.5 oz/69 gal water. Landscape only, not for use on plants for sale. Group 3 fungicide. 12-hr reentry. Trigo at 3 to 9 oz/100 gal water. Group 3 + 11 fungicide. 12-hr reentry. Reference Parks, C.G., and Flanagan, P.T. 2001. Dwarf mistletoes (Arceuthobium spp. ), rust diseases, and stem decays in Eastern Oregon and Washington. Northwest Science, 75 (special issue):31-37.